People buy Cadillacs in full expectation of owning a well-crafted American made luxury vehicle. The 2017 Cadillac XT5 does not disappoint and fulfills the firm’s mid-sized crossover SUV niche quite nicely. 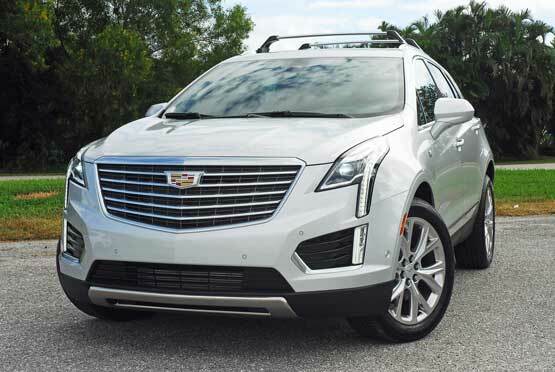 XT5 represents Cadillac’s Crossover Touring series of vehicles, replacing previous versions under the SRX banner. This particular market segment is historically the company’s largest seller. Whichever alphabet-soup naming scheme is employed, Cadillac has done a fine job in producing the XT5. Our test vehicle came as the Platinum, All Wheel Drive edition featuring distinctive interior and exterior eye-catching details—over and above the added standard features. Base pricing for the XT5 Platinum starts at $62,895 while a couple of high-tech options pushed us to just over $67,000. You can enter the 2017 Cadillac XT5 world with a base model for $39,395. There is ample room inside the XT5. Getting in and out is simple and effortless. One neither climbs up nor slinks into the driver seat. It’s easy to overlook that when trying on a car. My large frame felt comfortable inside the XT5, as did the myriad neighbors anxious to see the new Cadillac up close. I’ll let you in on something here and say out loud that my neighborhood has many families with school-aged children. Crossover SUVs rule the roost. These people can be brutally opinionated when it comes to new cars, mini-vans, and SUVs in general. In the end, they were quite impressed with Cadillac’s new offering. 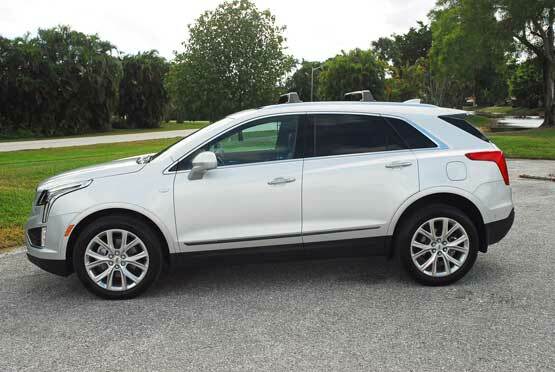 Our 2017 Cadillac XT5 is powered by a new 3.6 liter V6 engine coupled to an electronically controlled 8-speed automatic transmission with overdrive. Translation: this thing gets up and goes with little drama while still giving us decent highway MPG. Once accustomed to the gear selector mechanism, you’ll be off and going. Coolness prevails at the technology end of the XT5. Cadillac’s CUE infotainment system has improved over the years. While not quite intuitive enough for my Neanderthal thinking, it is better than previous editions and eminently adjustable. We spent a bit of time scrolling through menus in an effort to disable the multiple lane-departure, etc. warning systems. Our personal preference is to pay attention and drive the car ourselves rather than depend upon overly sensitive computerized driver-assist systems, however good they may be. That said, we were alerted a time or two for pedestrian cross traffic in a busy parking lot. There’s a real-time backward looking rearview camera/mirror feature that was at first odd then proved to be one of the best ideas we’ve seen in awhile. Connecting your Smart Phone is seamless to the system is painless enough. If you can manage your phone, Cadillac’s CUE will be a breeze. We like the way this car feels. Slide into the seat, reach out and touch the dash, console, and steering wheel. This is a very nice car. This is why people buy a Cadillac. Start the car. Watch the dash light up. Slip it into gear and drive away. The cabin is quiet, controls are smooth and positive, and acceleration brisk. Large disk brakes add confidence. 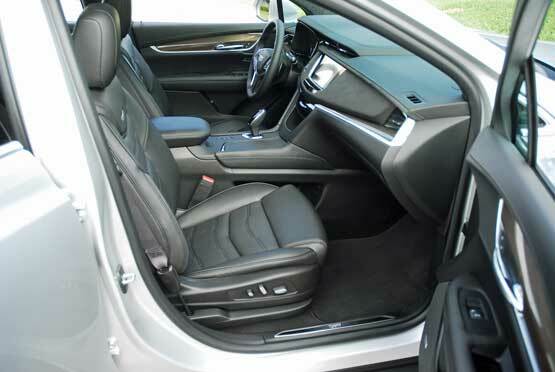 Comfortable seats, agile handling, and it’s easy to see why this is Cadillac’s best selling vehicle. Our single problem with the 2017 Cadillac XT5 comes by way of General Motor’s method of increasing MPG with an engine start-stop feature. At every stop, say a red light or stop sign, the engine shuts down to avoid idling away precious fuel. With the release of the brake or stepping on the gas, all operations return to normal. It takes a bit of getting used to. There may be a disable capability in CUE. We sure hope so. This feature bothered us most when pulling onto the driveway and trying to roll up our windows. The start-stop feature switches to reduced electrical mode and does not allow us to close the car without first restarting the engine in order to roll up the windows so we could shut off the engine. Confused? So were we. We’ll chalk it up to governmental regulations dictating technology. In the meantime, driving around in a 2017 Cadillac XT5 is a very positive experience.